Following on from the Everything’s Gone Green article and Fraser’s reminiscences I’ve uncovered additional information about the green kit and further evidence of its unpopularity, this time with the players. I mentioned that the introduction of the green and gold shirts coincided with Stan Pearson’s appointment as player-manager in March 1959 and I have now learnt that the colours were chosen by Stan’s wife. While it’s easy to appreciate the new manager wanting to create an impression it seems astonishing that the move away from the long established blue and white should happen in this way. Perhaps understandably this information was not publicised at the time and there is little doubt that a similar move today would be met with a massive outcry. I was speaking to Ronnie Hughes at a charity game in Mold on Sunday and he described the shirts as terrible. 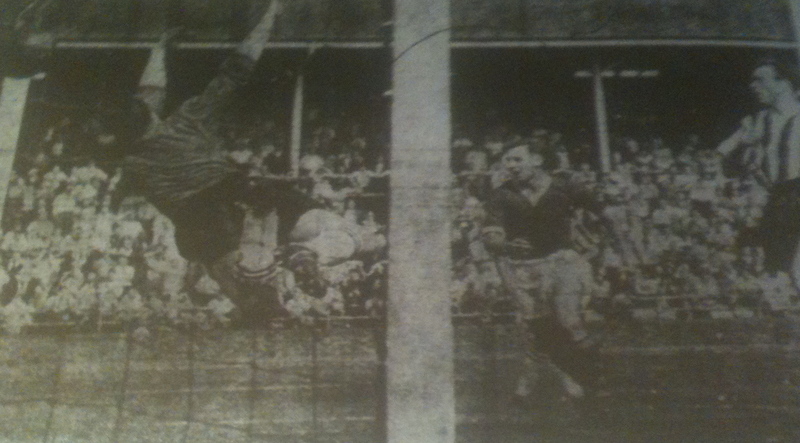 Ronnie, who played more than 400 times for Chester between 1951 and 1962 said that the switch from blue and white did not go down well with the players and the dressing room was very quiet for two or three weeks after the announcement. Full back John Evans was a regular in the Cheshire County League side until he made his full league debut in 1961. According to John the reserves used to inherit the first team’s shirt at the end of the season which were then passed down to the A team the following year and eventually used in training. He thought the shirts were awful and because the material was a mix of wool and cotton they didn’t feel good or wear well. In addition the colours were a dull green and faded in the wash so never looked smart. With such a negative feeling towards the colours it’s perhaps unsurprising that performances on the pitch also suffered. It’s easy to see why supporters should associate the green with bad luck and why they were hastily dropped after Pearson was sacked. 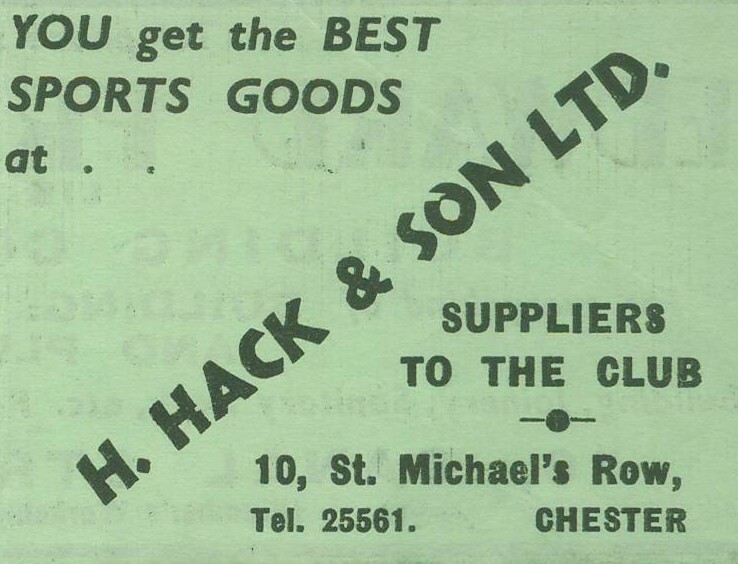 The green shirts were provided by Hack’s who had a shop in the arcade, on the right hand side as you enter from Bridge Street, and were regular kit suppliers for many years. 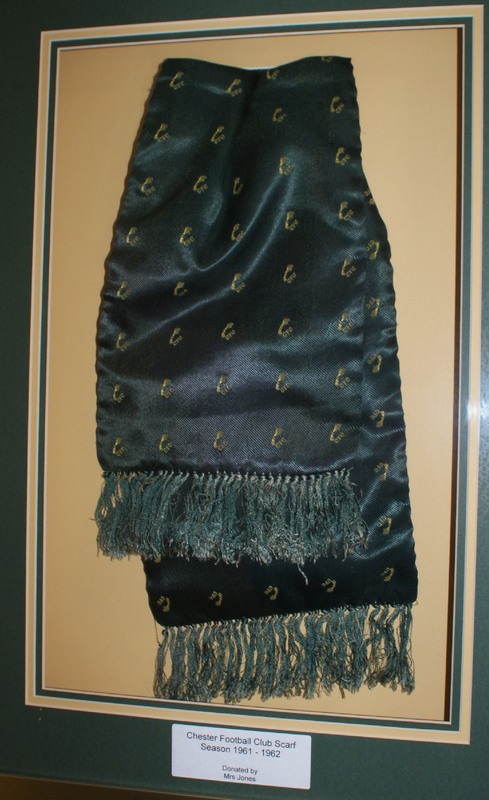 In the earlier article I included a photograph of a scarf which is on display at the Exacta and was donated by an old supporter. Both Ronnie and John remember that they were given similar scarves by the club one Christmas. John recalls that the players were always well looked after by the board of directors and received ties and scarves which were supplied by Bradley’s, an outfitters on Foregate Street. Meanwhile chairman Reg Rowlands always presented the players with a bowl of hyacinths from his florist’s shop at the festive period. Clearly a different era and difficult to imagine Manchester City handing similar gifts to Carlos Tevez and Mario Balotelli. When I first starting watching Chester they played in green shirts, old gold trim and white shorts. This sounds very appealing and I was rather pleased as the colours were very unusual, in a period of unimaginative and somewhat plain strips, but it was not a pleasurable experience to see the kit in action. The green, though by no means the dark ivy green of a hundred years or so ago, was by no means vibrant and was not as light as say Burscough’s kit. Neither did it have the brightening effect of a combination with white which we have seen in recent years with the hoops of Yeovil and Northwich. The ‘old gold’ is an intriguing description, but was in practice a dark (you could almost say ‘dirty’) yellow, and had the effect of muting the green. It was the official kit for three seasons, from 1959 to 1962. In the first two seasons it was combined with green and yellow hooped stockings, and in the last with yellow (‘old gold’). I don’t know whether statistics would prove that the winter of of 1960-1 was unusually wet, but my overriding memories of the time were of watching soaked and drab green shirts on a churned muddy pitch against the background of the weathered concrete and corrugated iron of the old stadium on an overcast day. What wasn’t actually rusty was painted a dark rust-red colour; even the gravel on the Kop, where the flagged terracing finished, seemed to be crushed from the local sandstone. Muddy green, brown, rust-red – it was like camouflage. So where did the green come from? For obvious reasons green isn’t the most practical colour to play a field-based sport in, and the few teams that use it tend to throw in generous dollops of white. Was it a memory in the mind of a director of the older green kit? 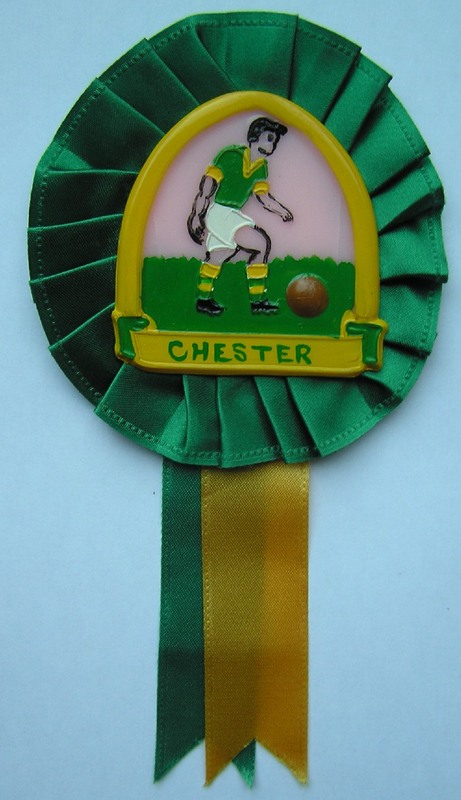 Information was at a premium in those days, and no-one in my generation was aware that Chester had played in green until 1920. But that was only forty years before 1959, when the colour was reintroduced. Nowadays we’re well aware of Chester’s colours in the 1970s; in fact, next season’s kit is a bow to the 1974 strip. So it could have been a harking back to the past. Or was it associated with Stan Pearson as manager? It was certainly dropped pretty sharply when he left. He was of course notably associated with Manchester United, and we have become aware in recent years that Newton Heath played in green and yellow. But this is last recorded in 1896 and in seems unlikely that in those pragmatic and non-nostalgic days that Pearson would have been influenced by this. It wasn’t very popular. There was a feeling amongst the older generation that it was something of an aberration from the traditional colours of blue and white stripes, and even the younger supporters, who hadn’t seen the old strip, felt that it was a somewhat unnatural colour. So the change to the iconic pinstripe in 1962-3 was generally welcomed. If nothing else it was brighter and cleaner. News travelled slowly in those days. Teams normally playing in predominantly blue colours still absentmindedly turned up with their change strip, which I remember annoyed me as a youngster. I was, for instance, looking forward to seeing Hartlepools United playing in their blue and white stripes and was less than impressed when they trotted out in red. By the time Chester readopted their blue and white in 1962 the penny had dropped that they played in green and we were treated to a succession of teams having to play in Chester’s old green shirts because they had brought only their (by now clashing) first choice colours. Take a bow again, Hartlepools United. On a personal level, the colours caused me some embarrassment. In 1961 someone gave me a programme of a League Cup tie between West Ham United and Plymouth Argyle in which it was stated that Plymouth were the only team in the Football League to play in green. Ever sensitive to any slight to my beloved Chester, I fired off a somewhat snotty letter pointing out the true state of affairs and was a little ashamed to get a nicely conciliatory letter in reply. Not a kit whose demise should be regretted. But I’m still fond of it because that was my bonding experience with Chester. 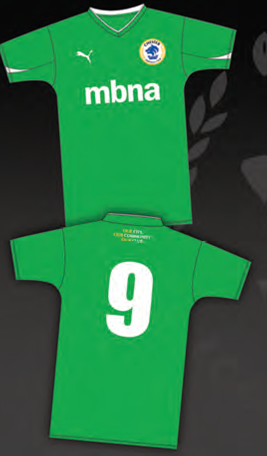 I like the look of the new green away shirt and it will not be the first time that the club have played in that colour. At various times throughout their history green has been used as the first choice strip as well as an alternative when colours have clashed. After temporarily disbanding in 1899 Chester emerged at their new ground in Whipcord Lane in 1901 and played in various combinations of green and white until 1920 when they switched to black and white stripes. It appears to have been a dark green shirt and team photographs suggest that the club also played in green and white stripes. More recently the club switched to green shirts with gold trim and white shorts from 1959 to 1962 but more of that later. By the time Chester entered the Football League in 1931 they had already adopted what we now consider the traditional blue and white stripes but initially used green as a change strip. 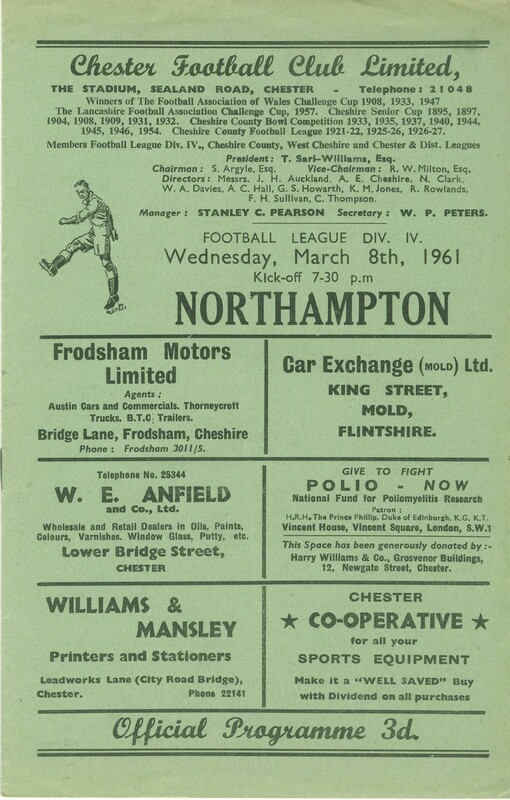 For their first ever Division Three North away fixture, at Wrexham, Chester were forced to switch to green because of a clash with the home side’s blue shirts. Hard to imagine now. 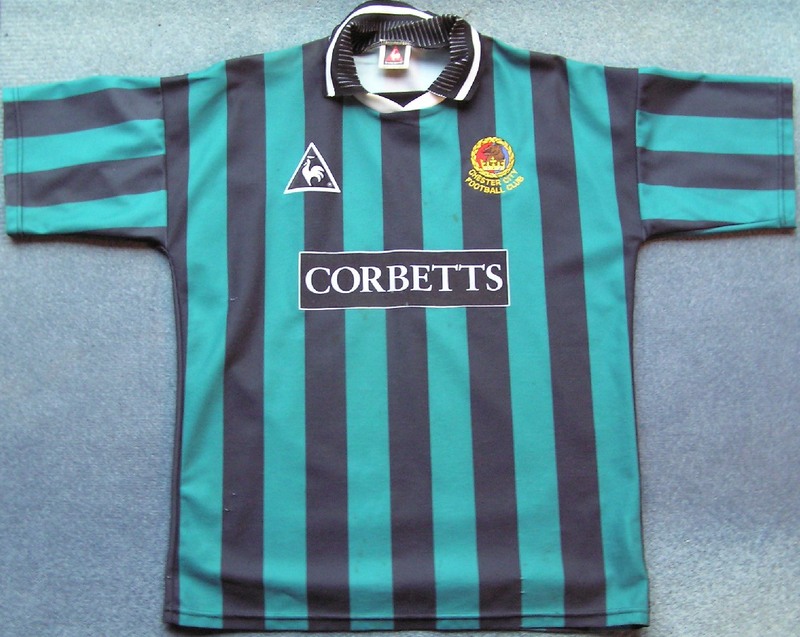 More recently, in an era of some truly awful shirts, City used green and black stripes as an alternative in 1995/96 and green and black checks in 1997/98. The 1995 option was actually described as jade and black and I personally rate it as one of the best away strips the club has used. The less said about the checked shirt the better. 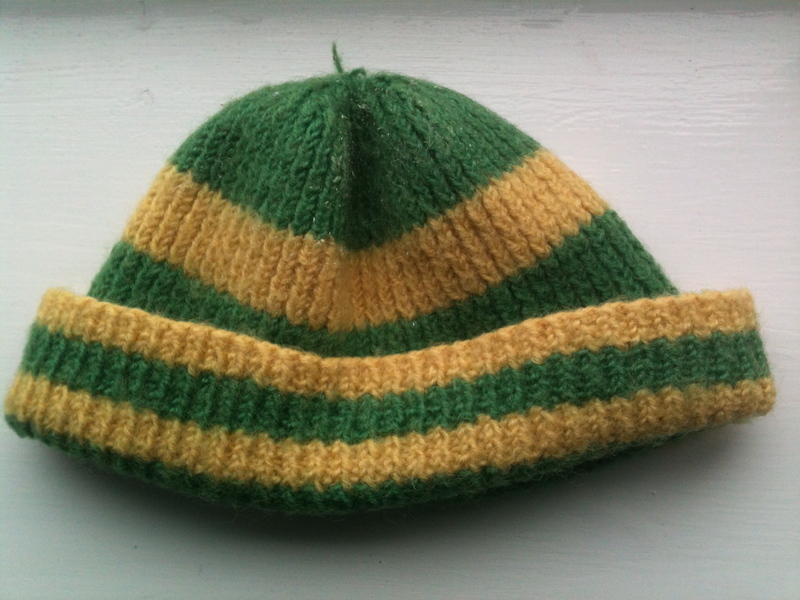 When Chester changed from blue and white stripes to green and gold in 1959 it was reported in the Cheshire Observer that the switch was made to avoid changes when colours clashed at away grounds. These days it seems to be the done thing for a club to automatically revert to a different strip for away games but at the end of the 1950s clubs would only change shirts if absolutely necessary. Blue was a popular colour at the time and a number of other clubs appear to have changed in 1959 including Watford (blue to yellow) and Southend (blue to white). With Cardiff City reputedly changing from blue to red next season it’s interesting to note that there were no reported objections when the change was announced at Chester. 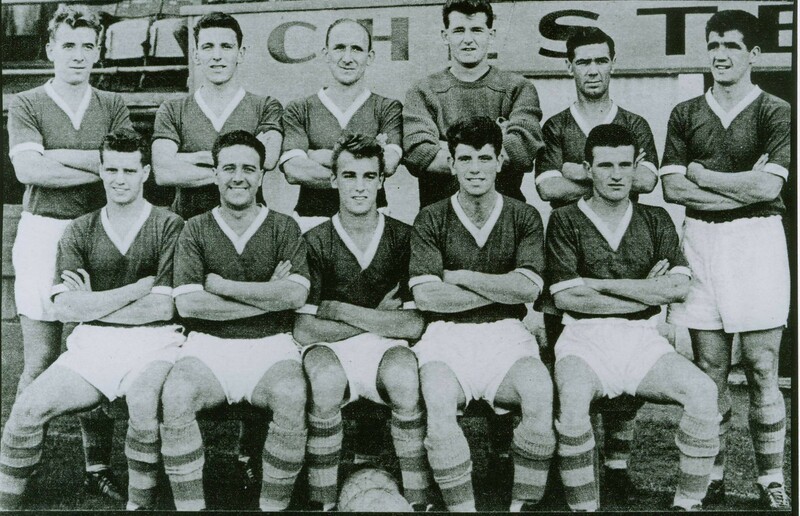 In changing to green Chester became one of only two teams to play in that colour alongside Plymouth Argyle. There doesn’t seem to be any explanation as to why green was chosen but it appears to have been chosen for its rarity value rather than as a conscious move to revert to the green used at the start of the twentieth century. There certainly seems to have been no rational reason why gold should be chosen for the collar and cuffs. The change in colours marked the beginning of Stan Pearson’s first full season in charge. The former Manchester United and England international had taken over as player-manager in March 1959 but the new kit brought little luck and became associated with a particularly bad run in the club’s history. The “continental style” kit had its initial outing in the traditional trial game at Sealand Road when the first team wore it against the reserves and promptly lost 3-1. It made its first appearance in a league game at Notts County where Chester lost 2-1 after Eric Davis had given Pearson’s side a first half lead. Chester managed to narrowly avoid re-election in 1959/60 but the next two campaigns proved disastrous with two bottom of the league finishes. The green kit outlasted Pearson who was sacked after a 1-0 FA Cup defeat to non-league Morecambe at Sealand Road in November 1961. 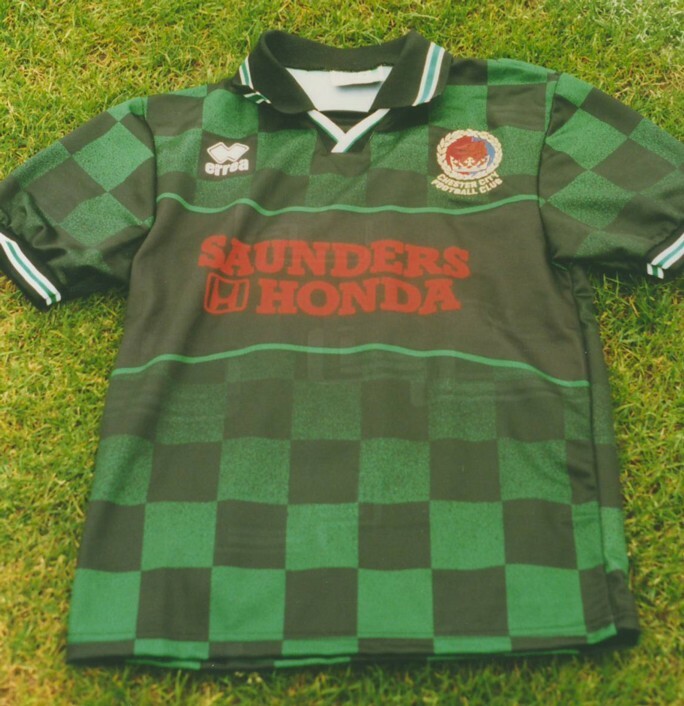 By that time Chester were in the middle of a run of 26 league games without a win and the green shirt was seen by some supporters as one of the factors behind this run. In December, after a 3-2 home defeat to Aldershot, the Cheshire Observer reported that one gentleman in the boardroom had put the blame on defeat on the green shirts. There certainly seems to have been a general feeling amongst supporters that the colours were associated with bad luck and that the green was not bringing Chester the luck of the Irish. Many fans also expressed their regret that the traditional blue and white stripes had been abandoned as this was still associated with many pre-war achievements. At the end of March 1962 the club announced they were discarding the green and gold and replacing it with white shirts with narrow blue vertical stripes and the new kit was first used in a friendly against German side Hamborn in April. Chester had briefly flirted with white shirts and black shorts in the weeks leading up to the announcement although ironically they were wearing the green and gold when the long run without a win was ended with a 4-1 victory over Chesterfield. I’ve never seen a colour photograph of the old green shirt but even in the black and white pictures it comes across as an extremely lacklustre kit. Next season’s away shirt looks a lot more vibrant and it’s impossible to imagine it having the same disastrous effect as the early 1960s version.